Living on an acreage means you will spend long hours keeping your yard looking sharp… after work and on the weekend. With bigger areas to maintain comes the need for bigger and more expensive equipment. Why not have a professional help free up your valuable time so you can do what you love. But how to pick a good service provider that understands your specific needs plus knows your acreage is unique? Rudi grew up on an acreage in Germany and got a good taste of what’s needed to keep a big property looking nice and crisp. Since 2005 he lives on an acreage just south of Spruce Grove and knows hands on, no acreage is the same in Parkland County. 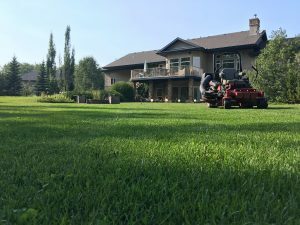 Currently we do not offer snow removal and weed control for acreages but we are happy to assist finding a reputable service. Due to the nature of the variety of acreage layouts we would love to meet with you on your acreage for an initial consultation.